Free trade came as a thief in the night destroying jobs in its path. Milllions suffered the lost of their jobs and businesses. 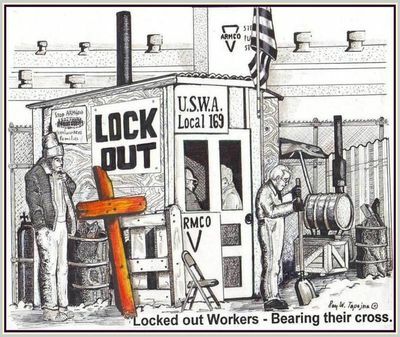 Workers were locked out of their jobs. A new working poor class was created as the production workers middle class was vanquished. There is a distinction between individualism and personality. Our personality reaches out to others for the sake of the common good for all in society. We all have the personal responsibility to respond to the evil we see lurking in society. Structural sin has a way of masking what is evil especially in our economic day which is set on rugged individualism and radical competition where we let powerful forces rule events that are not in tune with the Christian message of doing unto others as you would have them do to you. Instead we have economic systems like raw Capitalism Free Trade Economics where money and profits violate the rights of others who are due a just wage or fair markup for the fruits of their labor. Many in power have a plantation owner mentality thinking they know what is best for workers in economic settings In our times, many have lost the sense of the evil in the economic day and live off the suffering of others who make the things we use and consume. The Bible shows the only time Jesus got angry is when we confronted the money changers in the temple. In our global economy, the money changers are in control and apparently have a plantation owner mentality using free trade economics as a way to manipulate values including the value of workers and labor for the sake of profits. Production is subject to investments and is moved anywhere in the world for the sake of cheaper labor markets and avoiding the responsiblity for human dignity in the workday. They say their process is the best useful good for all even though million of workers lose their jobs and businesses for the sake of the whole. Worst yet, free trade economics has no faith that human nature is up to the task of seeking the life ideal on earth for all. In our country, Hurricane Katrina in New Orleans exposed a vast underclass population living in a silent depression. It was unreported in the media and there were really no statistics covering the situation even though the problem is evidently exists across our land in many cities, towns and rural areas. When a question of moral evil arises, we must personally get involved. Our governments do not have provisions for handling many of these situations and more than notactively or inactively avoid the issues. Governments can only do what the people react to. The solution rests with personal actions. The system can not change by itself. If fact the system is usually off track in many situations that can be called social or structural sin. The priority is to first change ourselves and acknowlege how free trade economics hurt our fellow man and society as a whole. Pope John Paul mentions the concept of structual sin. Sociology is a social science has been ignored relating to sin. Systems do arise and assimilate social habits from individual sins. Liberation Theology rising up in South America approach this flaw in human nature in the way we confront the struggles against poverty. Liberation Theology got a bad name internally by some Jesuits preaching it in a forceful way even calling for radical protests. However, Bishop Oscar Romero was never a part of this group. He will soon become a saint in the Catholic Church giving his life for the sake of the poor. He believed in liberation of workers' dignity.